This private tour gives you the chance to see alluring Shanghai at night, one of the most popular places in the world to spend night time. Meet your guide in your Shanghai downtown hotel lobby at around 18:00 pm and you will be driven to the Bund, the best vintage point to enjoy our spectacular Shanghai nightscape, when the western-style buildings and modern skyscrapers are beautifully lit. It’s gorgeous. Then move on to visit People&apos;s Square, the heart of the city by night. 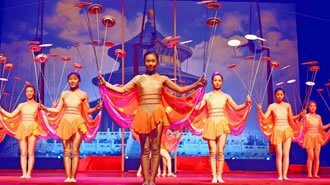 By 19:30 you will move on to the most exciting part: the Shangcheng Acrobatic Show (Type B ticket), one of the best shows in Shanghai for foreigners.During the nine different 10-minute segments, you will see typical acrobatics and comic sketches perfectly combined in one show. This lasts about 1.5 hour. When the show is finished, your guide will take you back to your hotel.